With so many operators at so many stages of their business in the transportation industry, there are many different levels of needs to address. Every operator has had to start somewhere with the goal to grow their business or accommodate their riders’ needs. Small companies need partners that value them and want to help them succeed. Larger companies have needs that may require a larger investment from their partners to accommodate. ABC Companies is a business built on building relationships and growing with its partners of all sizes by being flexible and attentive to evolving customer needs. As the exclusive North American distributor for Van Hool products, ABC is built around servicing customers from delivery of a new coach through all aspects of owning and servicing their fleet, no matter the customer’s size. Whether you have one coach, a small fleet without in-house expertise or a large fleet that requires its own maintenance management program, the goal is to maximize uptime and minimize costs. The team at ABC Companies understands the challenges of today’s customers and has built a suite of scalable solutions to meet the unique needs of all its customers. 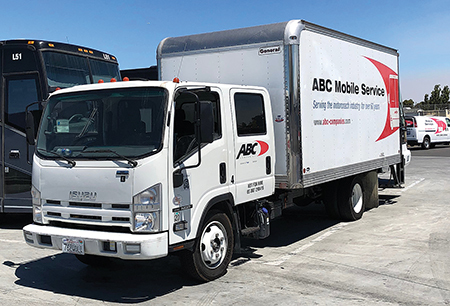 Helping its customers grow through programs such as its Tech Assist and Fleet Assist programs as well as providing mobile service units to keep customers on the road is just two ways that the team at ABC focuses on all size operator needs. Other customer-focused support has resulted in facility expansions and strategically placed new locations, such as its new location in Newark, CA, as well as recent expansions at other facilities, including Jersey City, NJ and Grand Prairie, TX. 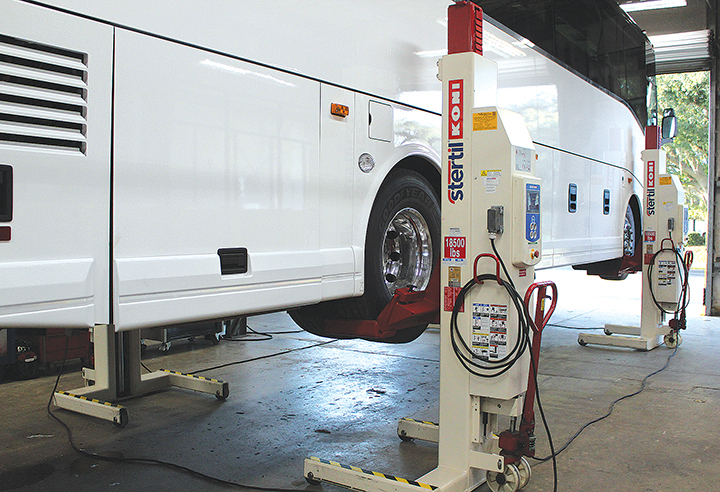 A motorcoach is a significant investment and it is important for operators to maintain their fleets as well as proactively perform preventive maintenance. The cost of downtime to service the coaches in addition to equipment and skilled technicians can sometimes be more than a business can support at its current stage. For many, this may not be an area you want to invest in or you may not have the time or resources to keep up with proper maintenance requirements. ABC Service locations around the country offer a fleet assist program that takes over the hassle of tracking, scheduling and maintaining your fleets. This program provides operators with a Fleet Support Manager to track and notify when normal service needs to be conducted on each coach. “The advantages to this program are numerous, including minimizing service disruptions, providing tighter budget control, quicker service turnaround and saving money,” said Ed Harmon, national director of operations for ABC Companies. ABC has recently rolled out its Tech Assist program, offering a solution for companies that may have a surge in business, downtime issues or simply lack the technical staff or expertise to get their coaches back on the road. Leaders at ABC know that any unplanned downtime will result in compounding opportunity costs due to lost business, making it imperative to get the fleet back on the road quickly. Under the Tech Assist program, the customer would work with ABC to identify the type of technical support that is needed and an appropriate expert would be provided in one-week blocks. This service has already been instrumental for several customers. Often, operators utilize this program to enhance coverage during a very busy period. It has enabled them to keep current on preventive maintenance by providing supplemental technical and mechanical support. In these situations, ABC is able to send the proper personnel and in partnership, the two companies can successfully keep the fleet on the road with the confidence of being properly maintained. Another struggle for operators is the ability to allocate the resources to drive a vehicle to a service location and wait for it to be serviced. The team at ABC recognizes this and continues to expand its mobile service unit fleet and capabilities in these areas to accommodate downed vehicles or coaches at customer locations. Currently, ABC offers these units from their Texas, Minnesota and Florida locations, operating regular and after hours for coaches in need of immediate assistance or scheduled service appointments at customer locations. 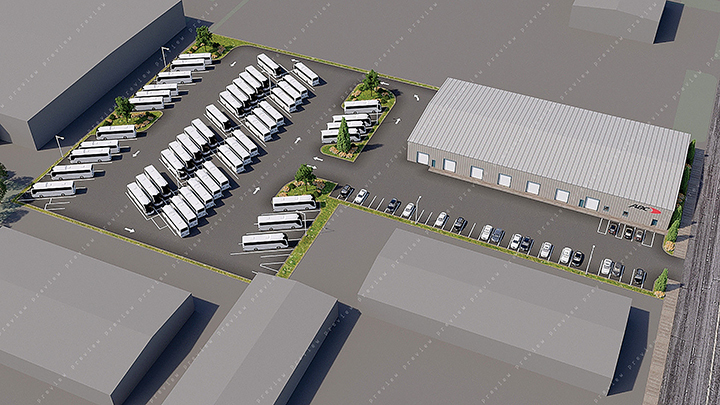 Rendering of ABC’s newest state-of-the-art facility in Newark, California, including two acres of dedicated on-site parking. As customer demands grow due to increased business or other requirements, it is important to work with an organization that can address those needs. As the service demands have grown in northern California, those at ABC Companies have been diligent in identifying how to address these needs. As an example, ABC has opened a new facility in Newark, CA. This is its third location in California and second in Northern California. Located just 15 minutes from its Redwood facility, the Newark location is a state-of-the-art full service operation offering 11 service and body bays. Notable capabilities include a full paint and body shop; two or three axle alignment capabilities; CHP inspection and light and heavy duty full maintenance capabilities; full cleaning services and a parts warehouse with extensive parts inventory for all makes and models of coaches. Given the parking constraints in the Bay area, the team at ABC recognized the need to accommodate operators’ parking needs. The new campus includes two acres of parking, providing over 65 parking spots with 50 dedicated for customer use. The facility is also already preparing for battery electric bus integration with parking spaces that will include charging capabilities. A good partnership starts with purchasing the right coach and should continue throughout the ownership experience. Whether you are a one coach owner and operator or have a large fleet with your own maintenance and repair capabilities, finding the right partner who can grow with your business is key to your success. Because no two businesses are alike, the right partner should be able to offer solutions that are specific to your needs. ABC has built a flexible and scalable suite of service solutions designed to accommodate almost any size customer. Just as important, investments and capabilities are continuing to be added to ensure they have what customers need today and tomorrow. ABC continues to build its service capabilities around an ever-evolving customer base, demonstrating that the relationship begins — not ends — after the sale.